The DM-FRS-400 is a biometric reader come with built-in controller that can be use to replace any existing standalone as well as network ( for network system the existing sofware will be replace with DM-FRS-400 access control system software) access control system by just replacing the Proximity/PIN-reader/Magnetic reader etc with the DM-FRS-400 system. All other hardware example the magnetic lock, power supply, door release button etc will all stay no replacement is required. This ensure that the new system can be implemented in a very short time without any major modification to the existing system.With the Biometric system implementation in your establishment you not only save money buying and replacing lost card but it also give you added security and the first image you give to your client will be tremendous. Residential and industrial premises/condominum, Lift and elevators,Offices and shops,Hotels,Country clubs, clubhouse, Airport facilities. Prison facilities, Military installation, Hospital, Petrochemical complex facilities, Power stations, Banks, safe and vaults, atm machines, Vending machines, High security facilities and many more......... As this product is a modular type and is also standalone, implementation of the above system to your existing access control system or facilities will involve very minimum modification and is also very cost effective. * Easy function button and practical design for user's convenience. * One unit internal system of Wide range communication system (RS 232/485, TCP/IP), Security device and Electronic lock device. * Single registration connects all the devices on the network. * The most steady device that is chosen by over 1,200 enterprises such as Post office of the whole country in Korea, Public institution, Laboratory,Company etc. * Export to 12 abroad countries such as America, Canada, Japan, China, Hong Kong, Switzerland, Philippine, Russia etc. * Acquired permission of importing safety by China safety, Russia and Certification of quality GOST PCT, CE, UL, FCC. There isn't a need to carry around card keys or ID and also worry about losing them or someone else using your card. Convenient function key and screen mode makes it easy to use, single registration connects all the devices on the network. Internal electronic locking controller makes it economical to install (no additional controller is needed). Processing speed is fast because all data is processed in the fingerprint device. Can store 720/2000/4400 fingerprint data and 4,000 processing data. Data backup in case of communication error. One relay Out port and one Input port. Using the sensor makes it easier to connect with other devices. Simultaneous use of Access Control and Time & Attendance available. Network system makes it easy to connect unlimited number of fingerprints to a single computer. English language displayed on the device. Supports 1~8 digit ID user. 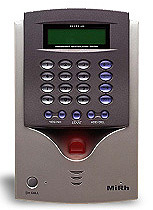 The DM-FRS-400 can operate as a standalone system that require no other specific device such as a controller or computer etc, and because the system uses the fingerprint to operate thus the user need not carry any key or password. To purchase the above DM-FRS-400 Fingerprint Controller / reader please call us at 65-67852171. If you need more information on this product or require a quotation on the above system to be implemented in your project please E-mail: sales@secureciti.com our sale and technical personnel will get back to you.All quotation will be provided by us on a no obligation basis.